In many modern architecture buildings built today, you can find stained concrete and decorative concrete finishes. These are just some of the many services offered by Southeast Floor Prep. Additional services include decorative quarts for restaurant food preparation areas, concrete polishing, waterproofing and epoxy services. There are a variety of methods to stain concrete. Acid stains are one method that is used. However, some of the acid based materials are not very environmentally friendly. At Southeast we use a much friendler material in leiu of the harsh acid based materials. One of the down sides of the acid stains is a limited selection of colors when using this method. Typical color variations for acid based stains include browns, tans, and soft blue-green shades. A larger varity of colors are available with acetone dyes. Acrylic concrete stains are used as a dye and produced a uniform appearance on the concrete. This method is typically used on exterior surfaces such as garages, patios, porches, driveways, and walkways. The benefit of stained concrete is that the colors become permanent and will not chip, peel or fade away. At Southeast Floor Prep we are licensed and insured Florida concrete staining specialists. Our stained concrete experts can provide a full range of staining, polishing and refinishing services for your concrete floors or driveway. Hire us today for concrete staining and stained concrete restoration and you will be glad you did! Concrete Floor Staining by Southeast Floor Prep is a wondrful way to enhance Concrete Flooring in your Miami area home. Our Florida Concrete Staining Contractors offer many choices for painting or staining your concrete flooring. The concrete coloring and staining options are virtually limitless and there are even a few health benefits to Concrete Staining or Finishing. Stained Concrete Floors offer a great look and are sure to last you a life time! 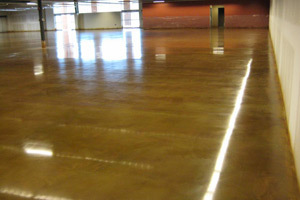 We at Southeast Floor Prep would be honored to spice up your Concrete Floor. Southeast Floor Prep can turn regular, dull concrete into a masterpiece. We can stain your concrete walkways, entrances, patios, driveways, living rooms and bathroorms. The smoother the service the better the stain will take. New concrete will need about 3 week to cure. After that it will need to be rinsed and scrubbed. Older concrete will need to be cleaned thoroughly. Our South Florida Concrete Staining experts will use the best equipment when staining your concrete. They have years of experience and always complete their work on time. If you are looking for Stained Concrete or a Concrete Staining Company in South Florida then please call toll free at 1-877-GRINDFLOOR (1-877-474-6335) or locally at 561-748-7754 or complete our online request form.